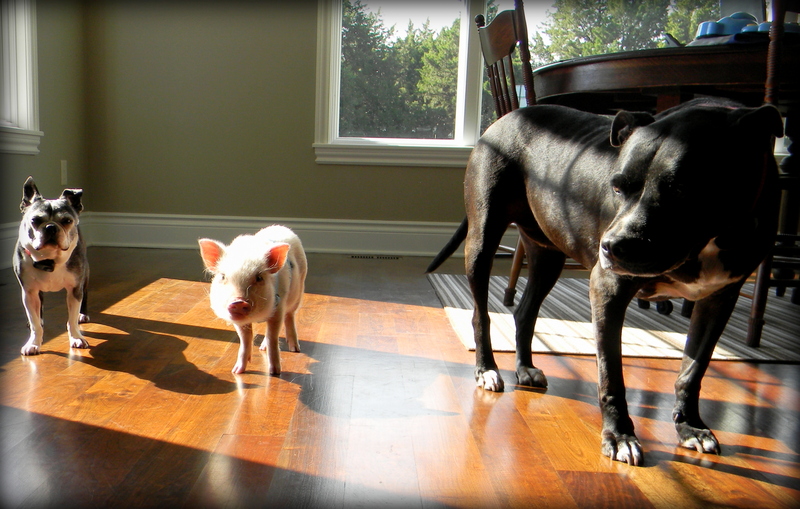 Before we decided to get Oscar, one of my biggest concerns was how our dogs would respond to a mini pig. I did my research and knew that mini pigs and dogs can be great friends, but they also can have disastrous outcomes. By nature, dogs are predators and mini pigs are prey so they must always be watched when together. Also, mini pigs are stubborn and often won’t back down when interacting with a dog which can lead to altercations. Since mini pigs aren’t able to defend themselves against a dog, they end up on the losing side of a battle. For these reasons, even in the best of circumstances, mini pigs and dogs should always be watched when together and separated when home alone. 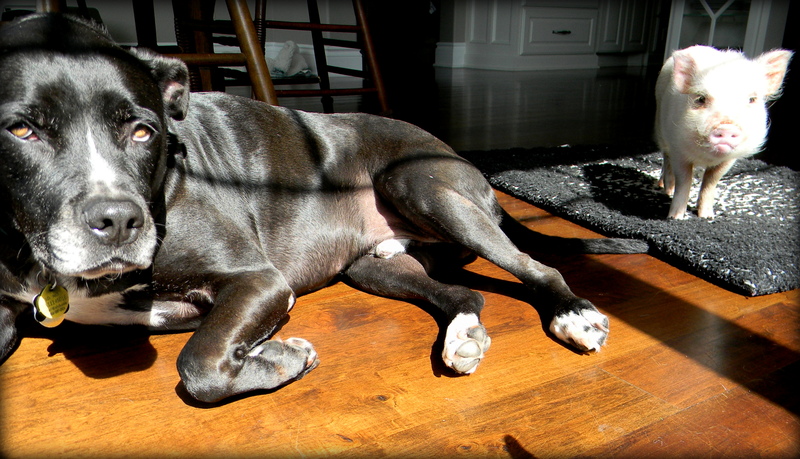 Oscar and our dogs in the sun spot. I was fine with watching them and keeping them separate when necessary, but I didn’t know if our dogs would be hostile or friendly with a pig. I love our dogs, but I had to be really honest with myself when assessing if they would tolerate a mini pig in our house. Rylee and Liam are generally friendly but both prefer people to other pets. They can be unwelcoming and anxious around new animals, so I was concerned about how they would respond to one completely unfamiliar to them. We made our decision to get a mini pig partly based on the fact that, while our dogs are often unwelcoming, they have never been aggressive with another animal. 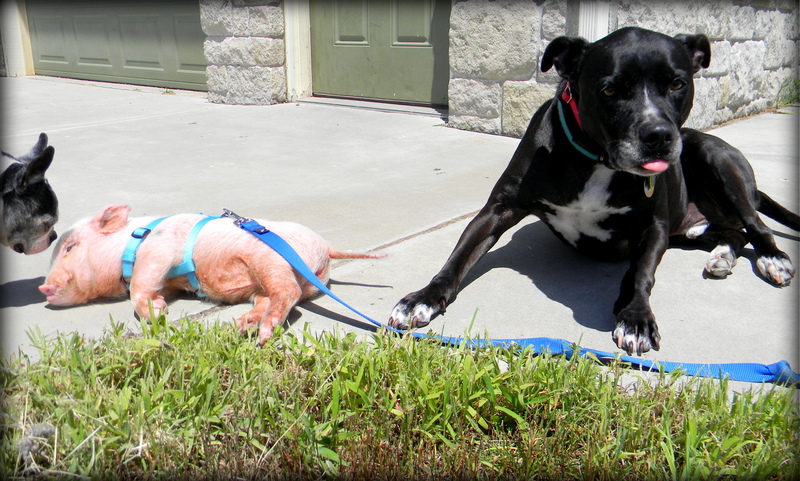 I expected that introducing a mini pig to our dogs would be challenging, but I thought they would eventually adjust. Still, I was really nervous. I wanted all of our animals to get along, and I knew there was a chance that our dogs wouldn’t enjoy or even tolerate a mini pig sharing their space. Liam prefers to stay alert when Rylee and Oscar are around in case they get any ideas. When we brought Oscar home, our plan was to get him adjusted to the house first and then slowly introduce our dogs in a neutral space outdoors. That’s not how it worked out. The first night we had Oscar home, during the big garage chase, our dogs could hear Oscar oinking and squealing, leaving them anxious and barking. After we caught Oscar and got him inside the house, he quickly fell asleep in his litter box. Since our scared, squealing pig was temporarily sleepy and calm, we decided to let our dogs come in to see Oscar in the hopes that it would calm them down. We leashed our dogs and introduced them one by one. They were upset, but Oscar had no reaction to the dogs. Oscar was around dogs at the breeder’s place and was so sleepy that he just ignored them. Without anything reacting back at them, our dogs eventually calmed down and became more curious than agitated. We watched them very closely for the first few days, but the dogs just wanted to inspect this new creature and Oscar was accepting and calm toward them. Our dogs are slowly adjusting to Oscar. Rylee is curious, and Liam is still a little scared. I wish I could tell you that Oscar and our dogs cuddle and play with each other, but that’s not the case. I still hold out hope that they will become great friends, but for now they are mostly indifferent to each other; our dogs tolerate Oscar but go about their own business. Rylee tries to play with Oscar on rare occasions, but she plays a bit rough and startles him. Liam is afraid of Oscar and moves across the room if Oscar gets too close or tries to share his blanket. On the bright side, Liam is slowly adjusting and lets Oscar get closer and closer each day, so I’m hoping they will eventually enjoy each other’s company. Oscar and Liam get along best when they share the sun spot in the mornings. I mentioned in a previous post that Liam is a food guarder, so we always feed our animals separately. Our mini pig will try to eat dog food if it’s out, and he’s crafty about finding ways to get to the bowl. Since Liam is protective of his bowl, that could be a recipe for disaster. For that reason, I always feed Oscar his meal and then put him in his crate while the dogs eat. I recommend this even if none of your animals have guarding tendencies since food is a precious resource to pigs and many dogs. If you have a dog and are considering getting a mini pig, the best advice I have is to be really honest with yourself about your dog’s personality, friendliness, and tolerance levels. This can be difficult to do when you love your dog so much and also really want a mini pig, but it’s important that your dog can adjust to the change and get along with a mini pig. I prefer thinking that my dogs have no flaws, but in reality Rylee is bossy and in-your-face with other animals, and Liam is fearful of almost everything and guards his food. I ultimately decided that adding a mini pig was a risk worth taking and it worked out for us, but it’s worth the time and effort to do your own assessment before making a final decision. I hope our dogs learn to love Oscar and allow him into their space more with time. As Oscar grows and their relationships change, I’ll update. Rylee is boss of the house now, but I’m guessing Oscar will challenge that hierarchy as he gets bigger! Hi, I just recently got a mini pig. I have 3 dogs. My big dogs love other animals, but when they first meet they are very rude. They tend to be pushy. How can I introduce them properly, so I can spend time with my dogs and my pig together? I have a crate that my pig sleeps in, she sees it as her “safe zone”, she’s already met my little yorkie mix and she doesn’t mind him as long as he doesn’t get close to her. Please help me! Thank you! Hi Macie! Depending on the personalities of your dogs, you might try a few different things. One is introducing your pig to your dogs through a baby gate or something like that where they can “meet” but not have direct contact quite yet. That might help you get a feel for how the real introduction will go. Another option, of course, is introducing them outside since it’s considered more neutral territory. You might end up being surprised about how the introduction goes, as I know I was between Oscar and our dogs. Our little dog can be very pushy and get in the faces of other dogs, and our bigger dog was always scared of things which caused him to act out and dog-to-dog interactions to go poorly. But, in our case, Oscar’s energy (he was really sleepy at the time) didn’t escalate the situation and, since he didn’t react at all toward the dogs, the situation was surprisingly uneventful. Now, I think we were lucky and of course these interactions can end up much more dangerous, so it’s good to be careful but keep in mind that the outcome could be different than you expect. All that said, if it were me, I would likely introduce through a gate first and then, if that’s going okay, introduce the dogs to the pig one on one just to keep the situation manageable. Hope that helps! Thank you so much for the advise! I will definitely try your advise! I also have another question. How can I get my pig used to a harness and walking on a leash so I can take her outside? I got her from a lady that that didn’t have any interaction with her until I got her. She follows me everywhere I go now. I just want to be able to walk her and get her use to being able to going outside and eating bugs and grass! Again thank you for your help!! Hello ! I have a “mini pig” she’s about 7 months.. I’m planning on moving out of my moms house so I’ve been looking for apartments , It’s been so hard because they only accept dogs and cats. I just found today one apartments that would accept Leah , she needs to be under 50 pounds (I believe she’s ok) and they have a dog in the office so they want me to bring her in to see if she’s friendly and respectful to other dogs. I am sooo scared because let’s be real , not many pigs are friendly. And Leah happens to fall in that category.. what can I do ? I am very irregular with her diet and give her about anything .. should I be more strict ? And how can I make her be nice ? Hi Nashalee! On the diet, I would personally recommend being more regular with her food. I’m definitely not a nutritionist or an expert in that area so I recommend researching how you want to approach this, but we feed Oscar his pellets twice a day and occasionally give him a salad in the middle of the day. We give him the salad more often in the winter when he isn’t eating grass outside. He does get some snacks, but we keep them to veggies and small bits of fruit. I’ll link to an article below about mini pig nutrition that might be helpful. What you want to avoid is getting her into bad habits that are tough to change later. On the apartment, I think you’ll just have to follow what the apartment is asking and hope for the best. Unfortunately, they are pretty much in control of the decision, so hopefully it goes smoothly and works out. One thing I recommend is educating them a bit about pigs and dogs so that they have a better understanding of what to expect. If they expect your pig to be like a dog, the meeting likely won’t go well. In fact, my take on this is that they are actually putting your pig in more danger than any of the dogs. So, while their concern is that she is respectful and friendly to other dogs, it seems to me they don’t understand mini pigs (which they won’t if they haven’t been around them of course) and could use some very polite educating from you. I would explain to them that pigs are prey animals and dogs are predators and that pigs don’t have many ways of defending themselves. So, in many cases, especially where your pig might run into dogs outside, your pig is more at risk than the dogs. So, talk to them and have the meeting if that’s what you need to do to get your apartment, but hopefully they will listen and understand about the differences between dogs and pigs. Arm yourself with as much info as you can and hopefully the meeting will go well! I haven’t been in that situation at this point so that’s all just my opinion and how I would approach it. I hope it all works out! Hey! What do you give Oscar to eat? Because I have a mini pig and they told me to give him dog food but I do some research and I read that dog food is really bad but I have already feed him with dog food and I am really worried because I don’t know if dog food will cause any harm to him. Please help. Stop feeding dog food ASAP. Get mazuri mininpig food. Can be found at any Fram supply store.